I just realized that today we hit 2 good milestones! Firstly, we said goodbye to one of Evie's many medications. This is her 6 month anniversary since her heart surgery for three holes in her heart! She has had to take half a baby aspirin as a preventative measure for six months after the surgery. Today we stopped on doctor's orders, and good riddance! Cutting pills in half and then getting them to dissolve in a small syringe of water to put in her g-tube is not something Daddy will miss. The other milestone is that we don't have to see the Ear, Nose and Throat specialist anymore! Since she doesn't wheeze with stridorous sounds from laryngomalacia, and also since she hasn't had any ear infections, the doctor doesn't need to see Evie anymore unless she gets an ear infection. 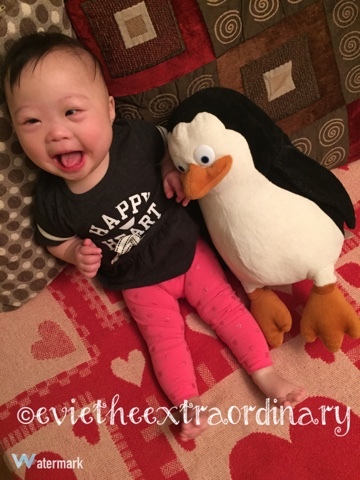 Kids with Down Syndrome are more vulnerable to ear infections due to their ear anatomy, but Evie has been lucky so far. Thank you, God! One less doctor to visit!